REDDING, Calif. - Simpson University music professor Dwayne Corbin will serve as resident conductor of the North State Symphony while the organization transitions to a new director, the symphony board announced this month. As resident conductor, Dr. Corbin will lead secondary-level concerts and be on call to fill in for rehearsals as needed, among other tasks. He has already been unofficially functioning in this role during the 2013-’14 season, including planning and conducting the symphony’s holiday concerts. Dr. Corbin, who holds a doctoral degree in conducting from the University of Cincinnati Conservatory of Music, will retain his position of principal percussionist with the symphony, a role he has held since 2006. 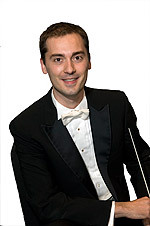 An award-winning composer and associate professor of instrumental music at Simpson University, he is also conductor/music director of the Shasta Symphony Orchestra (a cooperative ensemble between Simpson University and Shasta Community College), and a regular presenter of jazz and classical recitals. During the North State Symphony’s search process, conductors who have applied for the music director position being vacated by Kyle Wiley Pickett will lead the orchestra concerts. The North State Symphony was created in 2001 from the merger of the Redding and Chico symphonies and functions as a program within Chico State University. Learn more at northstatesymphony.org. Simpson University is a Christian university offering undergraduate, graduate, and teaching credential programs. The Music Department offers degrees in composition, performance, worship ministries, and music liberal arts. For more information on the music program and events, visit simpsonu.edu/music. For more information about Simpson University, or to arrange a campus visit, call 1-888-9-SIMPSON or visit simpsonu.edu.